Last month was our second trip to Hawaii as a family of 4! 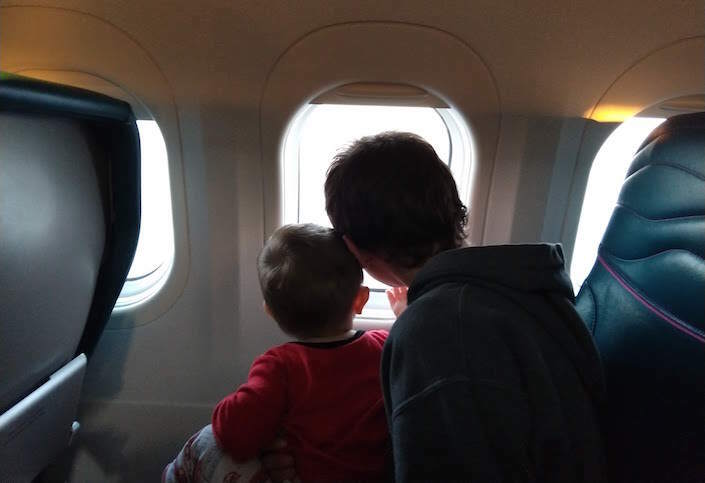 We are two adults, one 12 year-old, and one 21 month-old (who completed his 27th flight as a “lap baby” on this trip). We flew San Diego to Honolulu on the one daily Hawaiian Air flight available, which departs in the morning on an Airbus A330. We did a cheap online bid for the lay-flat first class seats and didn’t get it. They offered it to us again at check-in for over $400 per seat, but we weren’t willing to pay that much for first class because it was a measly 6-hour daytime flight. Instead we snagged bulkhead seats in premium economy (aka “Extra Comfort”) in the middle of the 2-4-2 seat configuration for $80 each. That worked out great, because we had easy access to the mid-plane galley for when Baby J barfed 4 different times. After a long layover, we took the 30-minute inter-island flight over to Maui. The island-hopper planes are all Boeing 717s or ATR 42 Turbopros or something similar. There was no reason to upgrade on such a small plane for such a short flight, so we stuck with basic economy. The one daily direct flight from Maui to San Diego on Hawaiian Air is on an Airbus 321 (a smaller plane than the A330), and again we upgraded to premium economy. Pro tip: first class on HA’s A330 does not have lay-flat beds. Premium economy is a better bang for your buck by far. The homebound flight was just under 5 hours. Our total cost for all flights was $1,234.81. Thats for 3 “adults” and a “lap baby” flying on Saturdays during the peak spring break season. 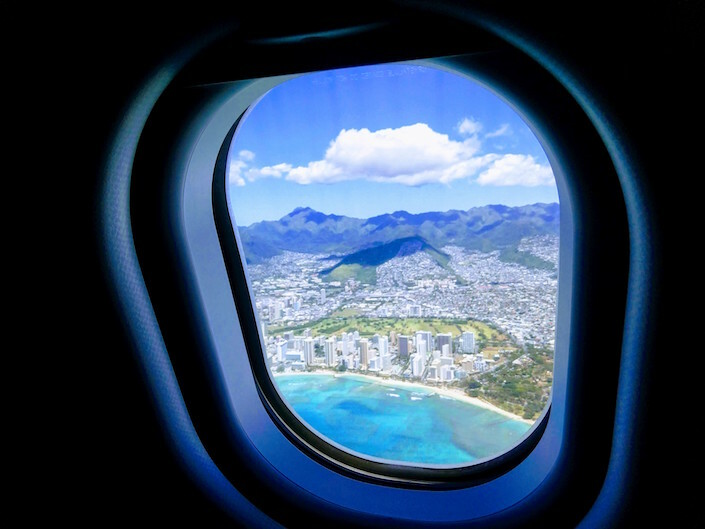 You can read the full cost breakdown here, including the details of our annoying but ultimately cost-effective struggles with the Hawaiian Air Mastercard and rewards program. Families traveling with kids under 2 board right after the first class passengers. Hawaiian Air knows their game. The island music is playing as soon as you board, the soap in the bathroom smells like coconut, and the cookies are shaped like pineapples. The seats in premium economy were perfect for us with our “lap baby” because the cushions were wide and full enough that they made a sort of couch when the armrests were up. Baby J could sit between two of us in this manner and not have to be on anyone’s lap. Sky couch! Super comfy. There was supposedly some in-flight entertainment available on the Hawaiian Air app (download before you board) but most of it cost extra as far as we could tell. We were locked and loaded with our own phones, tablets, and ipods, so we didn’t need to use it. The harsh reality is that when flying with a toddler your entertainment often consists of starting at the flight tracker, willing the plane to move faster. Hawaiian Air serves a hot meal even in coach on flights to and from the mainland, which is much appreciated in contrast to the “pay extra if you want food during domestic flights” attitude on many airlines. They also served a complimentary rum-punch for adults and tropical juice for the kids an hour before landing. There was ample diaper-changing space in the lavatories. Our fabulous crew was unfazed by Baby J’s need to puke every 90 minutes over the Pacific (and once right before we parked at our arrival gate). They swooped in like hawks with that anti-stink powder and biohazard bags every time it happened. One of the great things about morning flights from the mainland to Honolulu is that you arrive pretty early in the day. If you’re connecting to another island, you can take as little or as much time as you want between your inbound flight and your connection, since the island-hoppers to the popular airports take off at regular intervals all day. There are not luggage lockers at HNL anymore, so plan accordingly. 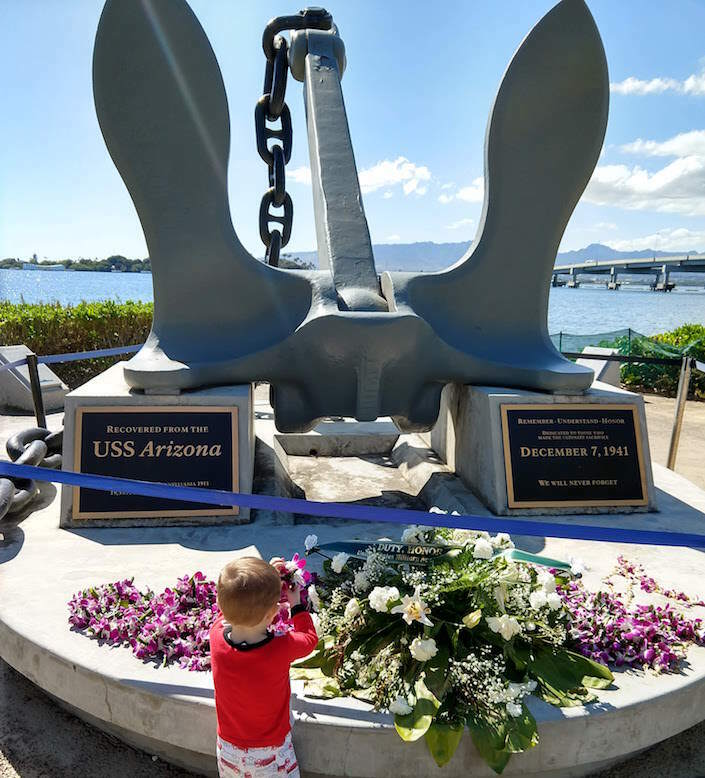 We arrived around 1pm in Honolulu and booked our flight to Maui for 7pm so that we’d have time to show our boys Pearl Harbor. If you are traveling with older kids or adults, you’ll probably want to spend more time there than we did (reserve your tickets in advance). 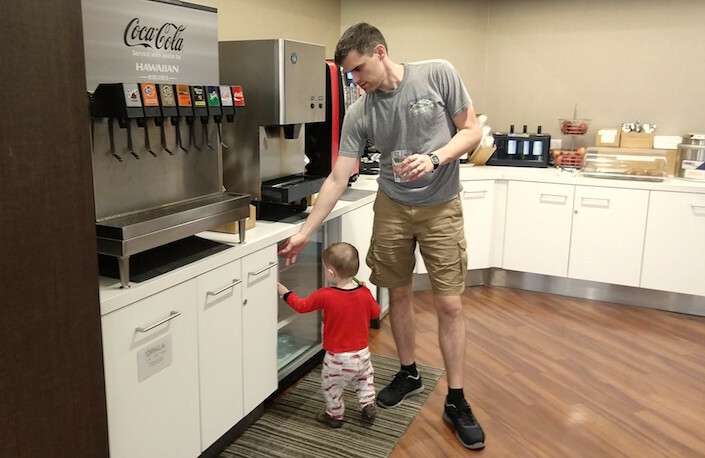 In our case, a half-day was the perfect amount of time to be there with a toddler. If you just have one or two things you want to see in the Honolulu area, consider a purposefully long layover to check them off your list. It makes for a very high-energy but very fun travel day. After our day out in Honolulu, we headed back to HNL for our inter-island flight and busted out our Priority Pass to grab snacks at the Plumeria Lounge. The entrance to the Plumeria Lounge was buried under several layers of airport construction zones, but the inside of the lounge was clean, quiet, and uncrowded. The lounge offerings would probably not impress you fancy first-class-only world travelers, but it had everything we needed in terms of food and drink and a space to relax. We were the only family there, and everyone was friendly with the kids. It was a short and easy walk to our gate. 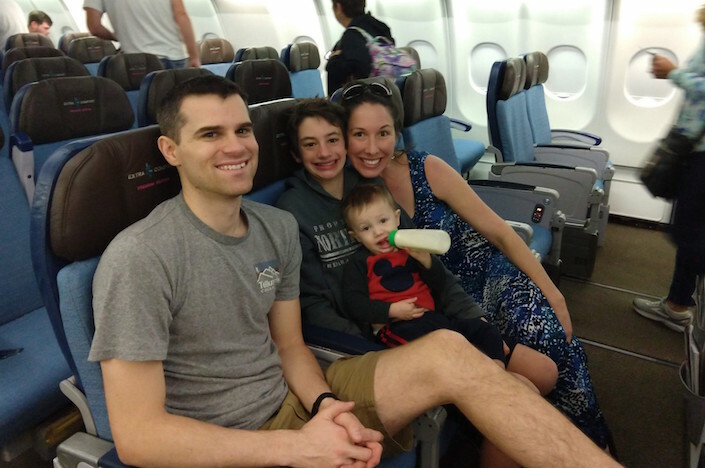 The short and sweet of it is: If you’re going to Hawaii with your kids, Hawaiian Airlines is a great choice. Don’t bother getting their credit card. Do upgrade to premium economy for the extra leg room. Hawaiian Airline’s safety record is excellent, their aircraft are nice, and their prices are competitive. They do a good job with customer service and family-friendliness, and you’ll arrive smelling like guava juice and plumerias. In February of this year, I made some calls to the lovely folks at the Department of Education and Student Aid and confirmed that from 2005 to 2013 I took out almost $350,000 IN STUDENT LOANS! The exact total amount of money I borrowed for school – including tuition, fees, supplies, and “cost of living” funds – was $347,634. That total is principal only and includes none of the interest accumulation, which was quite significant over the course of all those years. The loans were dispersed between 2005, when I started dental school, and 2013, when I finished my specialty residency. What buffered me from the full impact of my student loan total and led to some incorrect math on my part – in addition to the long time span over which the loans were pulled – was the fact that I had income for 2 years in between dental school and my specialty residency (when I worked for a private practice and completed a paid hospital residency). I was paying down some loans between 2009 and 2011, so the total principal I owed at any given time was never quite as high as the total amount I borrowed. When I saw my loan totals after graduating in 2013, I assumed that I had taken out way less student debt than average for my field, when in fact I had taken out somewhat less student debt than average. After my first year of speciality income, I paid tens of thousands of dollars just in INTEREST (not a typo) on my student and business loans, and something clicked: I needed them gone, and fast. Because of my drive to destroy my debt (and my husband’s enthusiastic support), our student loan balances fell rapidly in the few years after that. Our story lies in sharp contrast to some doctors, who for whatever reason don’t even pay enough towards student loans to keep the interest at bay, leading to ballooning student loans even after school is over and income is plentiful. MY STUDENT LOANS ARE GONE. $347,634 (plus interest) repaid in full. No tricks, no secrets, no bailout from family members or forgiveness from the government. Getting rid of that much student debt would be exciting enough of its own, but let’s add that total to the business debt I’ve repaid on my practice (which in my mind all goes under the larger category of “professional debt” in my life), and we get $847,634 of loan principal that has been wiped out! It’s been 5.5 years since I graduated. If I can do this, you can too. I am not a major outlier in what I make as a doctor, and I have no other secret income pouring in. I work part-time in a high cost-of-living area. My husband is a middle school math teacher. We aren’t super frugal; we live a very comfortable life and we spend a lot of money on non-essentials. We have a mortgage and two kids and we travel quite a bit. While this post is admittedly self-congratulatory, I also hope it can be encouraging. If you have a truckload of student debt, please know that you are not alone, nor are you fated to languish under your debt for decades. You are the same intelligent, capable person who put in years upon years of hard work to be in the top of your high school class, your college class, and maybe even your doctoral class. You’ve passed incredibly rigorous board examinations. You’ve obtained a degree and license that is just a dream for thousands of people. You are in control of your personal finances. If fast and efficient debt repayment is what you want, GET AFTER IT.